The third largest cat in the world (after tigers and lions), and the largest western hemisphere cat. Males can reach up to 300 pounds in the Pantanal region of Brazil, but are more commonly 250 pounds, with females about 200 pounds. Jaguars in northern Mexico are only about 150 pounds for males, 100 for females. Jaguars used to be found in the southern United States but are considered extinct here now; a male occasionally crosses over from Maxico, but there is no breeding population. The last wild one recorded in California was shot in the late 1800's. 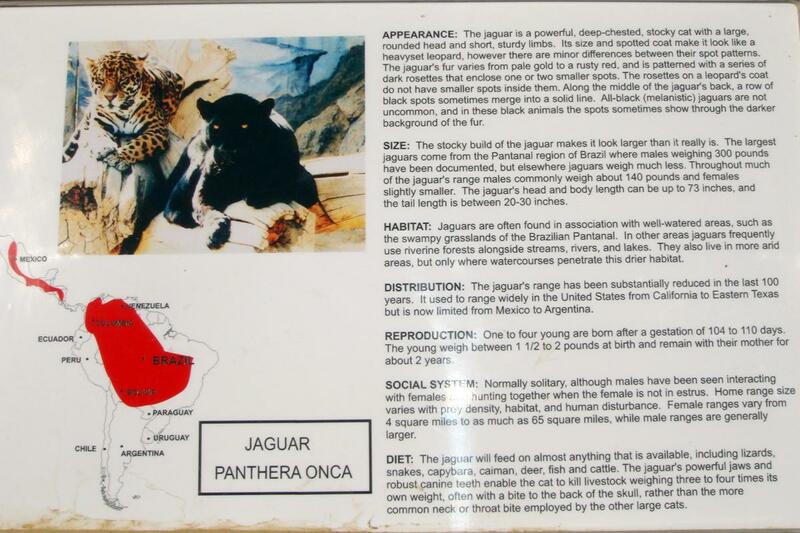 Subspeciation in jaguars is under debate; all captive jaguars are currently managed as one meta-population. They look like a larger, stronger cousin of the leopard. Their rosettes are larger and set farther apart, with enclosed spots more common than in the leopard. They are much more muscular, in particular in the neck region. They are one of only a few cats that enjoy water. In many areas they are declining or near extinction, however they are listed as Near Threatened because of the large numbers surviving in the Amazon basin rainforests. Overall they are close to Vulnerable status, with three potential subspecies being in worse shape. They face extirpation at the hands of local cattle ranchers, fragmentation of forest habitats, deforestation rates of up to 15%, and competition with humans for prey.